Currency for international travel and cross-border payments is predominantly purchased from banks, foreign exchange brokerages and various forms of bureaux de change. These retail outlets source currency from the inter-bank markets, which are valued by the Bank for International Settlements at 5.3 trillion US dollars per day. The purchase is made at the spot contract rate. Retail customers will be charged, in the form of commission or otherwise, to cover the provider's costs and generate a profits. One form of charge is the use of an exchange rate that is less favourable than the wholesale spot rate. The difference between retail buying and selling prices is referred to as the bid–ask spread. There is a market convention that determines which is the fixed currency and which is the variable currency. In most parts of the world, the order is: EUR – GBP – AUD – NZD – USD – others. Accordingly, in a conversion from EUR to AUD, EUR is the fixed currency, AUD is the variable currency and the exchange rate indicates how many Australian dollars would be paid or received for 1 Euro. Cyprus and Malta, which were quoted as the base[clarification needed] to the USD and others, were recently removed from this list when they joined the Eurozone. Quotation using a country's home currency as the price currency is known as direct quotation or price quotation (from that country's perspective)[clarification needed] For example, EUR 0.8989 = USD 1.00 in the Eurozone and is used in most countries. Quotation using a country's home currency as the unit currency[clarification needed] (for example, USD 1.11 = EUR 1.00 in the Eurozone) is known as indirect quotation or quantity quotation and is used in British newspapers ; it is also common in Australia, New Zealand and the Eurozone. Market convention from the early 1980s to 2006 was that most currency pairs were quoted to four decimal places for spot transactions and up to six decimal places for forward outrights or swaps. (The fourth decimal place is usually referred to as a "pip"). An exception to this was exchange rates with a value of less than 1.000 which were usually quoted to five or six decimal places. Although there is no fixed rule, exchange rates numerically greater than around 20 were usually quoted to three decimal places and exchange rates greater than 80 were quoted to two decimal places. Currencies over 5000 were usually quoted with no decimal places (for example, the former Turkish Lira). e.g. (GBPOMR : 0.765432 - : 1.4436 - EURJPY : 165.29). In other words, quotes are given with five digits. Where rates are below 1, quotes frequently include five decimal places. In 2005, Barclays Capital broke with convention by quoting spot exchange rates with five or six decimal places on their electronic dealing platform. The contraction of spreads (the difference between the bid and ask rates) arguably necessitated finer pricing and gave the banks the ability to try and win transactions on multibank trading platforms where all banks may otherwise have been quoting the same price. A number of other banks have now followed this system. A movable or adjustable peg system is a system of fixed exchange rates, but with a provision for the revaluation (usually devaluation) of a currency. For example, between 1994 and 2005, the Chinese yuan renminbi (RMB) was pegged to the United States dollar at RMB 8.2768 to $1. China was not the only country to do this; from the end of World War II until 1967, Western European countries all maintained fixed exchange rates with the US dollar based on the Bretton Woods system. But that system had to be abandoned in favor of floating, market-based regimes due to market pressures and speculation, according to President Richard M. Nixon in a speech on August 15, 1971, in what is known as the Nixon Shock. For carrier companies shipping goods from one nation to another, exchange rates can often impact them severely. Therefore, most carriers have a CAF charge to account for these fluctuations. 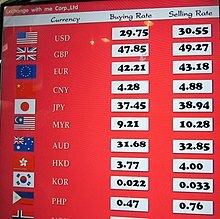 The real exchange rate (RER) is the purchasing power of a currency relative to another at current exchange rates and prices. It is the ratio of the number of units of a given country's currency necessary to buy a market basket of goods in the other country, after acquiring the other country's currency in the foreign exchange market, to the number of units of the given country's currency that would be necessary to buy that market basket directly in the given country. There are various ways to measure RER. The Real Exchange Rate (RER) represents the nominal exchange rate adjusted by the relative price of domestic and foreign goods and services, thus reflecting the competitiveness of a country with respect to the rest of the world. More in detail, an appreciation of the currency or a higher level of domestic inflation drives up the RER, worsening the country’s competitiveness and reducing the Current Account (CA). On the other hand, a currency depreciation generates an opposite effect, improving the country’s CA. There is evidence that the RER generally reaches a steady level in the long-term, and that this process is faster in small open economies characterized by fixed exchange rates. Any substantial and persistent RER deviation from its long-run equilibrium level, the so-called RER misalignment, has shown to produce negative impacts on a country’s balance of payments. An overvalued RER means that the current RER is above its equilibrium value, whereas an undervalued RER indicates the contrary. Specifically, a prolonged RER overvaluation is widely considered as an early sign of an upcoming crisis, due to the fact that the country becomes vulnerable to both speculative attacks and currency crisis, as happened in Thailand during the 1997 Asian financial crisis. On the other side, a protracted RER undervaluation usually generates pressure on domestic prices, changing the consumers’ consumption incentives and, so, misallocating resources between tradable and non-tradable sectors. Given that RER misalignment and, in particular overvaluation, can undermine the country’s export-oriented development strategy, the equilibrium RER measurement is crucial for policymakers. Unfortunately, this variable cannot be observed. The most common method in order to estimate the equilibrium RER is the universally accepted Purchasing Power Parity (PPP) theory, according to which the RER equilibrium level is assumed to remain constant over time. Nevertheless, the equilibrium RER is not a fixed value as it follows the trend of key economic fundamentals, such as different monetary and fiscal policies or asymmetrical shocks between the home country and abroad. Consequently, the PPP doctrine has been largely debated during the years, given that it may signal a natural RER movement towards its new equilibrium as a RER misalignment. Starting from 1980s, in order to overcome the limitations of this approach, many researchers tried to find some alternative equilibrium RER measures. Two of the most popular approaches in the economic literature are the Fundamental Equilibrium Exchange Rate (FEER), developed by Williamson (1994), and the Behavioural Equilibrium Exchange Rate (BEER), initially estimated by Clark and MacDonald (1998). The FEER focuses on long-run determinants of the RER, rather than on short-term cyclical and speculative forces. It represents a RER consistent with macroeconomic balance, characterized by the achievement of internal and external balances at the same time. Internal balance is reached when the level of output is in line with both full employment of all available factors of production, and a low and stable rate of inflation. On the other hand, external balance holds when actual and future CA balances are compatible with long-term sustainable net capital flows. Nevertheless, the FEER is viewed as a normative measure of the RER since it is based on some “ideal” economic conditions related to internal and external balances. Particularly, since the sustainable CA position is defined as an exogenous value, this approach has been broadly questioned over time. By contrast, the BEER entails an econometric analysis of the RER behaviour, considering significant RER deviations from its PPP equilibrium level as a consequence of changes in key economic fundamentals. According to this method, the BEER is the RER that results when all the economic fundamentals are at their equilibrium values. Therefore, the total RER misalignment is given by the extent to which economic fundamentals differ from their long-run sustainable levels. In short, the BEER is a more general approach than the FEER, since it is not limited to the long-term perspective, being able to explain RER cyclical movements. Bilateral exchange rate involves a currency pair, while an effective exchange rate is a weighted average of a basket of foreign currencies, and it can be viewed as an overall measure of the country's external competitiveness. A nominal effective exchange rate (NEER) is weighted with the inverse of the asymptotic trade weights. A real effective exchange rate (REER) adjusts NEER by appropriate foreign price level and deflates by the home country price level. Compared to NEER, a GDP weighted effective exchange rate might be more appropriate considering the global investment phenomenon. The increasing volume of trading of financial assets (stocks and bonds) has required a rethink of its impact on exchange rates. Economic variables such as economic growth, inflation and productivity are no longer the only drivers of currency movements. The proportion of foreign exchange transactions stemming from cross border-trading of financial assets has dwarfed the extent of currency transactions generated from trading in goods and services. A country may gain an advantage in international trade if it controls the market for its currency to keep its value low, typically by the national central bank engaging in open market operations in the foreign exchange market. In the early twenty-first century it was widely asserted that the People's Republic of China had been doing this over a long period of time. Other nations, including Iceland, Japan, Brazil, and so on have had a policy of maintaining a low value of their currencies in the hope of reducing the cost of exports and thus bolstering their economies. A lower exchange rate lowers the price of a country's goods for consumers in other countries, but raises the price of imported goods and services for consumers in the low value currency country. ^ O'Sullivan, Arthur; Steven M. Sheffrin (2003). Economics: Principles in action. Upper Saddle River, New Jersey 07458: Pearson Prentice Hall. p. 458. ISBN 0-13-063085-3. ^ "Triennial Central Bank Survey : Foreign(other countries) exchange turnover in April 2013 : preliminary global results : Monetary and Economic Department" (PDF). Bis.org. Retrieved 23 December 2017. ^ Peters, Will. "Find the Best British Pound to Euro Exchange Rate". Pound Sterling Live. Retrieved 21 March 2015. ^ "Barclays upgrades eFX platform with new precision pricing". Finextra Research. 7 April 2005. ^ "Wayback Machine" (PDF). 24 August 2006. ^ "Currency Adjustment Factor - CAF". Academic Dictionaries and Encyclopedias. ^ "Currency Adjustment Factor". Global Forwarding. ^ a b Erlat, Guzin; Arslaner, Ferhat (December 1997). "Measuring Annual Real Exchange Rate Series for Turkey". Yapi Kredi Economic Review. 2 (8): 35–61. ^ a b c d Dufrenot, Gilles J.; Yehoue, Etienne B. (2005). "Real Exchange Rate Misalignment: A Panel Co-Integration and Common Factor Analysis". IMF Working Paper. 164. ^ a b c d Akram, Q. Farooq; Brunvatne, Kari-Mette; Lokshall, Raymond (2003). "Real equilibrium exchange rates". Norges Bank Occasional Papers. 32. ^ a b Jongwanich, Juthathip (2009). "Equilibrium Real Exchange Rate, Misalignment, and Export Performance in Developing Asia". ADB Economics Working Paper. 151. ^ Di Bella, Gabriel; Lewis, Mark; Martin, Aurélie (2007). "Assessing Competitiveness and Real Exchange Rate Misalignment in Low-Income Countries". IMF Working Paper. 201. ^ Jongwanich, Juthathip (2008). "Real exchange rate overvaluation and currency crisis: evidence from Thailand". Applied Economics. 40: 373–382. ^ Williamson, John (1994). Estimating Equilibrium Exchange Rates. Peterson Institute for International Economics. ^ a b c d Clark, Peter B.; MacDonald, Ronald (1998). "Exchange Rates and Economic Fundamentals: A Methodological Comparison of BEERs and FEERs". IMF Working Paper. 67. ^ Salto, Matteo; Turrini, Alessandro (2010). "Comparing alternative methodologies for real exchange rate assessment". European Economy - Economic Papers. 427. ^ Zelealem Yiheyis (December 1998). "The Economic Determinants of the Parallel Currency Premium: Evidence from Select African Countries" (PDF). Journal of Economic Development. 23 (2). This page is based on the Wikipedia article Exchange rate; it is used under the Creative Commons Attribution-ShareAlike 3.0 Unported License (CC-BY-SA). You may redistribute it, verbatim or modified, providing that you comply with the terms of the CC-BY-SA.